Back in August, Cleveland Golf gave many of its fans what they wanted, a return to market with a full line of clubs. While it does not seem like it was all that long ago, the previous shift in philosophy caused many to look at Cleveland as strictly a wedge brand, and a darn good, but still just a wedge brand. However, now we are talking about a full line release, consisting of driver, fairway woods, hybrids, and two sets of irons to go along with the recently released CBX wedges, as well as a refresh of the 2135 putters. In other words, a brand that many thought might have eased in to retirement, is back, and in doing so resurrects their iconic product name: The Cleveland Launcher. This iteration is known as the Launcher HB, with the hybrid being the focal point of this article. Much of the technology that is present in the Launcher HB driver has carried over to the fairway woods and hybrids. For those who are not familiar with Cleveland’s products of the past, the HB in this name brings the term HiBore back in to the conversation. Golfers who do remember the previous generations HiBore crown, will recall how the crown severely sloped down from the topline to the rear portion of the head. Whereas, every other crown on the market appeared rounded, the HiBore crown presented itself more like a spoon with its scooped-out look. For the Launcher HB, this design is much tamer, however it still serves a purpose by helping to achieve a low and deep center of gravity. 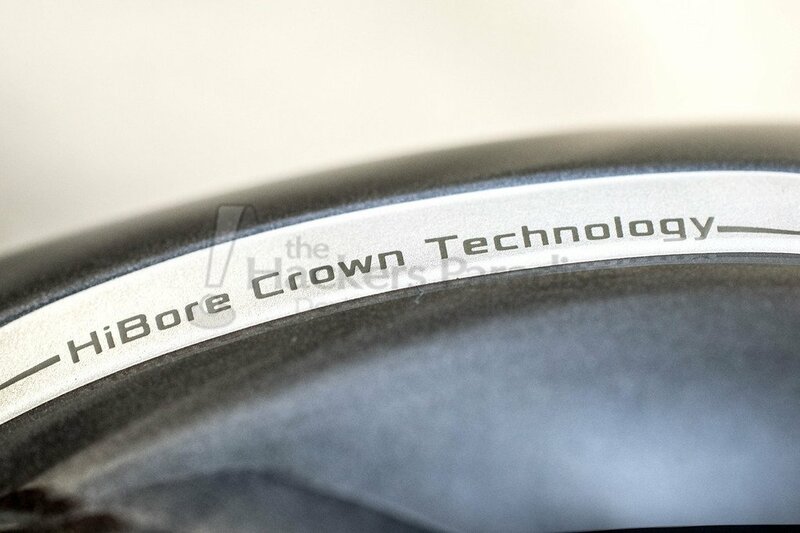 Not all of the visible technology is housed on the crown of this hybrid, turn it over and eyes are easily drawn to several silver ridges that make up the heel and toe area of the sole. These ridges are what Cleveland refers to as Flex-Fin Technology. Flex-Fin Technology is used to help maintain ball speeds when contact strays from the center of the face. This is accomplished by having these areas compress at contact and decompress to transfer more oomph into the shot. Just like the Hi-Bore Crown, Flex-Fin Technology can be found on the driver and fairway woods, although the driver and 3-wood also have the added benefit of a cup face design. Partaking in the battle to save as much weight as possible, Cleveland has forgone the adjustable hosel and instead gone with an ultra-lightweight fixed hosel. By eliminating the extra weight needed for an adapter, Cleveland engineers were able to produce the lightest hosel design in company history. As is noted by the use of many different materials, saving weight in certain areas allows designers to redistribute those savings into other areas. 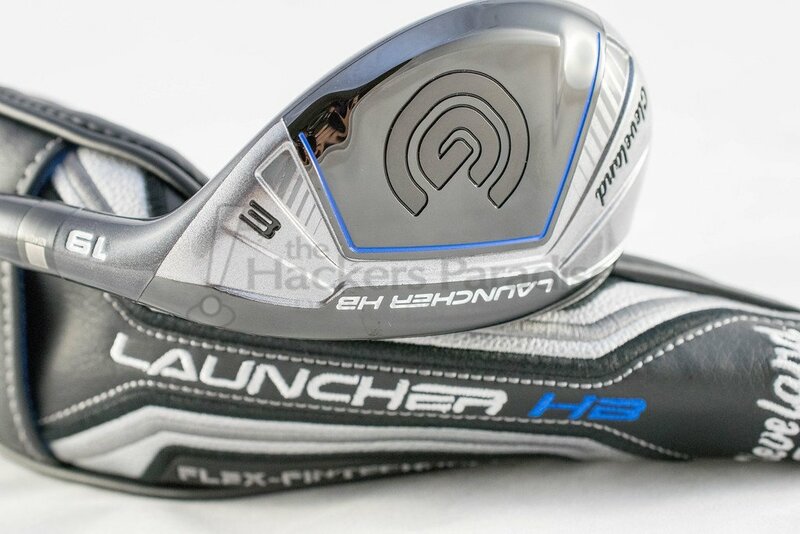 For the Launcher HB, those savings have allowed the company to push that extra weight low and deep in the clubhead, which will help produce higher launch. 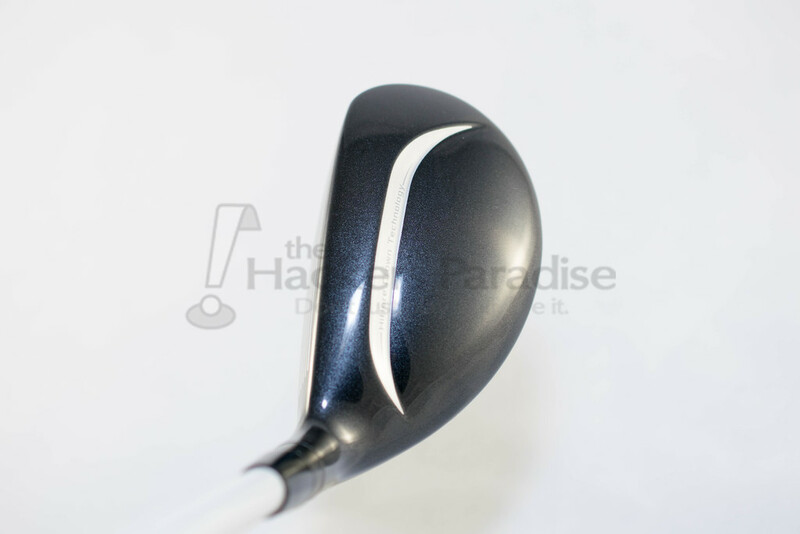 Being that one of the main technological points of this hybrid is the HiBore crown, perhaps it is best to start talking about the shape this club provides. In terms of size, the length from heel to toe is really comforting to the eye. Being that the Launcher platform is aimed to make the game easier, it makes sense that this hybrid offers a bit more reassurance to the eye when stepping up to take a shot. It may not be the cleanest looking hybrid due to the silver stripe that cascades across the crown, but that stripe does serve multiple purposes. For one, it provides some visual technology by announcing the presence of the HiBore crown, but it also helps frame the ball really well because of its contrasting color. Being that the crown is absent of an alignment aid, this stripe of silver can easily help a player make sure they have a rather square clubhead behind the ball. While spending ample time with this hybrid there were some performance characteristics that certainly stood out. One being that the Launcher HB Hybrid feels as if it’s a bit head heavy, and that’s not necessarily a bad thing. With the heavier feel, it made hitting this club a bit easier as one can really just let the head do the work. This heavier feeling leads to my second point, the ball just wants to jump up in the air off of this club. Well struck shots climb effortlessly and just seem to carry with a strong trajectory, and while there does appear to be a bit of a draw bias in terms of internal weighting, it does not completely overpower the ball flight. 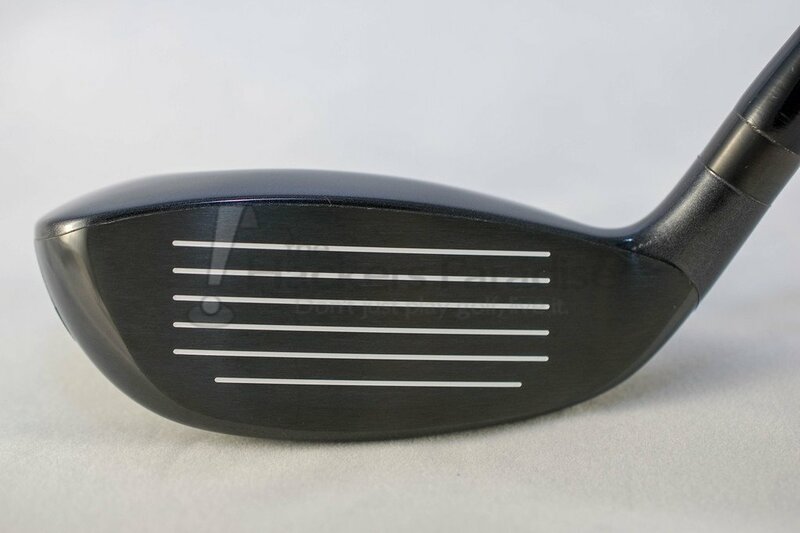 Original thoughts from the course were that this hybrid offered enough forgiveness to recommend it to those looking for an easy to hit club that wouldn’t severely penalize on a miss-hit, and with that longer looking face, there is plenty of real estate to miss with. However, when it came to pure distance, the Launcher HB came up a handful of yards short of where one might expect a 19° hybrid to land, and obviously everyone’s mileage will vary. This wasn’t a glaring issue, but it was noticed on the course, and backed up with a Foresight launch monitor. Below are numbers captured with the GC2 and the Launcher HB, and overall they are rather good. Numbers can only tell so much of the story, but by looking at these it’s easy to see that the Launcher HB offers a design that gets the ball up in the air and reaches a good peak height, all while keeping spin in check. 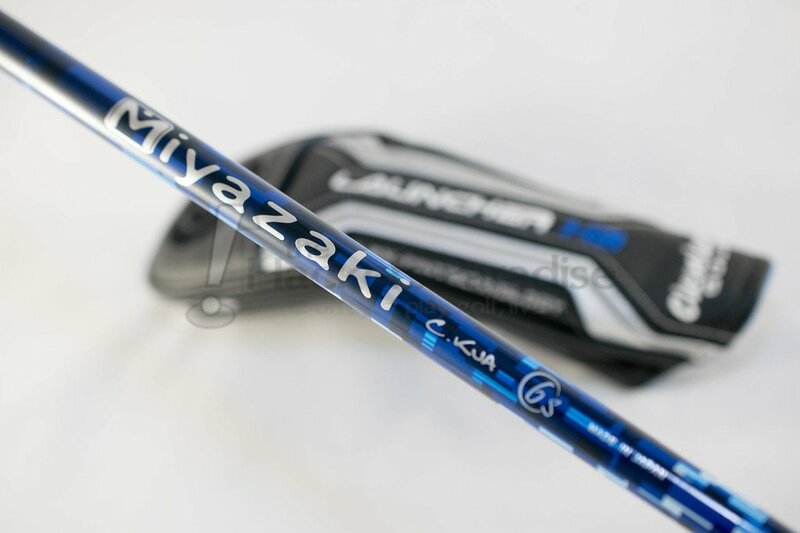 Not only is the Launcher name one that many Cleveland fans will find familiar, but they may also recognize the Miyazaki name that stretches along the top portion of the shaft. Aesthetically speaking, the C. Kua shaft looks incredible with a blue top that fades to white as the shaft approaches the hosel. Installed in this particular hybrid was the 6s model, which weighs in around 57 grams. Miyazaki still uses the international flex code, which assigns a number from one to ten, in relation to shaft stiffness upon four sections of the shaft. That flex code number on the 6s is a consistent 5555, which gives the C. Kua a stable feeling throughout the swing. One might think that with a hybrid designed to launch the ball up in the air with ease, that the tip section might be a bit softer by design, however that is just not the case here. Having the Cleveland Launcher back on the shelves is rather exciting for those of us who remember the Launcher of yesteryear. The hybrid part of this lineup should not disappoint players who are looking for an easy to launch and control hybrid. Meanwhile, those who find success with this hybrid should take a look at the rest of the lineup. Priced at $199, the Launcher HB hybrid is currently available in stores. More information on the resurgence of Cleveland Golf and the Launcher HB lineup can be found at www.clevelandgolf.com. Great thorough review Dean. 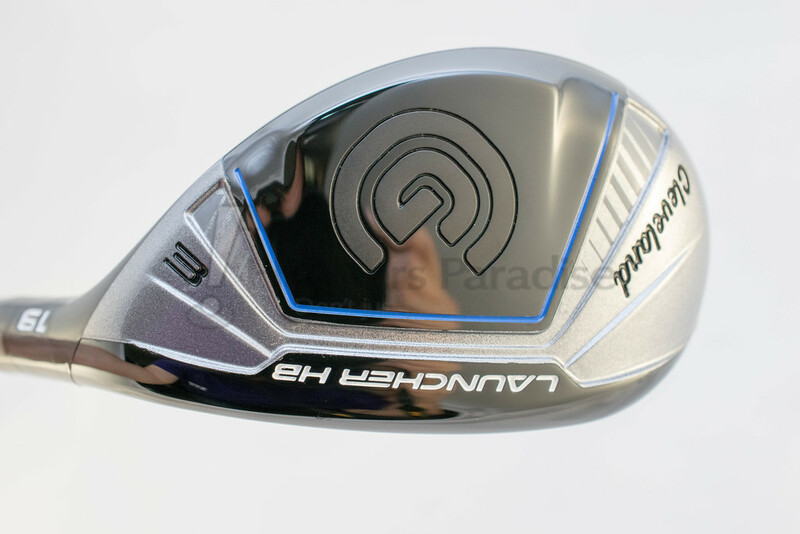 Not surprised that the launch was very good with this but am a bit surprised that it did not turn out to be more of a distance hybrid instead of the distance being more iron replacement like. Great review Dean. I’d love to demo these on the course. Nicely done Dean! Good info! I’m also surprised the distance didn’t follow the CBX irons as I found them to be long. Can’t say I like the white on the crown but if it performs, I could over that in a hurry. Great review Dean, I’m glad to see Cleveland back with a full line of clubs. The lack of adjustability doesn’t bother me and it sounds like they put the weight savings to good use. I’m not one that wants a distance hybrid as they are nothing more than an extension of the irons for me designed to land at a specific yardage. with that said, a drop in 5-10 yards would cause concerns for me cause that’s the difference between being in a trap/water instead of on the green but would really have to see how it integrates into the bag. Nice review Dean! Add me to the list of folks happy to see CG back on the scene with a full compliment this season. Fond memories of the launcher lines for sure, and it looks like they’ve carried this forward with the HBs. Need to hit these to see how I feel about the distances. Great review Dean. I enjoyed hitting it on the range a couple of weeks ago. I do like the Hibore tech – and them going to the fixed hosel to reduce the weight makes sense, you feel the entire club through the swing. Good to see Cleveland back offering full lines with a nod to their past.